The Ili pika is a tiny mammal with a teddy bear face that was discovered in 1983. 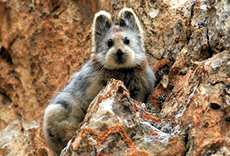 Scientists had no idea this cute little creature existed until it was discovered in the Tian Shan Mountains of northwestern China. 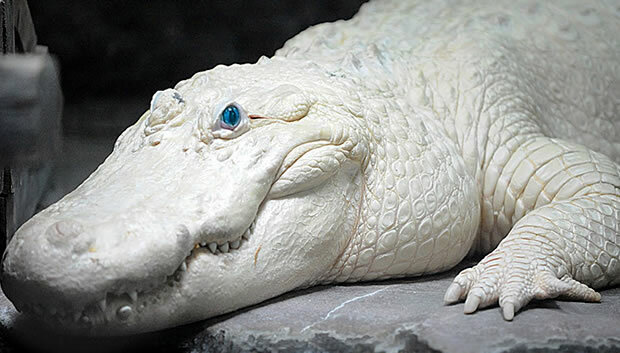 Only a few people have seen this furry critter, discovering it by accident, and only 29 sightings have been confirmed. It resembles a rabbit with short ears and possesses brightly colored hair and large rusty-red spots on its head and neck. Adults may weigh up to 205 grams (1/2 a pound) and may reach up to 8 inches long. The Ili pika lives high in the mountains (as high as 13,000 feet). Diet consists of grasses, herbs, and other mountain plants. Pikas are known to store food hidden between rocks, forming "haypiles." They spend most of the summer clipping plants with their sharp, rabbit-like teeth and stuff the plants into one large haypile or several smaller haypiles. Scientists believe pikas get most of their water from their food, but they have been seen drinking from lakes, ponds, and streams. Since they are found in the mountains they are equipped for cold weather, and they don't hibernate. They are territorial and have been seen defending their territory. They have been observed calling to each other when they see a predator such as a hawk or dog. Pikas are able to reproduce when they reach one year old. They can live up to 7 years. Females can carry 2 or 3 litters or babies (leverets) each year, but it is rare for more than one litter to survive. When they give birth, the liter size is usually about 3 leverets. Like many other mountain-dwelling creatures, the pika is very sensitive to changes in its environment. In the 1990's, it was estimated that only 2000 individuals existed in the wild, and the population is decreasing in number. The pika may be losing its food supply due to competition with grazing livestock in some areas of its range, and it also suffers from air pollution. The nation of China considers this species endangered, but there are no other efforts to preserve the species at this time. Copyright Notice: This article is licensed under the GNU Free Documentation License. It uses material from the Wikipedia article "Ili pika". Glenn, C. R. 2006. "Earth's Endangered Creatures - Ili Pika Facts" (Online). Accessed 4/21/2019 at http://earthsendangered.com/profile.asp?sp=2943&ID=3. Need more Ili Pika facts?